- Partnerships, Alliances & Strength. Locally known, globally renowned. DBT Corporate is a Sydney based, specialist commercial business travel management company, providing fast, friendly business travel solutions for local, national and global firms; with emphasis on professional service, going the extra mile and reducing your spend through following some simple business travel management practices. Take the time to visit our overview and enjoy the concept of a boutique and personalised business travel delivery promise. VIRGIN Australia is introducing new “carrier charges” in connection with tickets booked using Velocity frequent flyer points, with the move effective for bookings from 01 Jan 2019. The carrier charge will apply to all Virgin Australia operated flights as well as Delta Air Lines operated and marketed services between Sydney and Los Angeles. class and $3.50 in Economy. Qantas has struck a codeshare deal with Netherlands flag carrier KLM Royal Dutch Airlines. The Australian national carrier will place its code on KLM's daily flights between Singapore and Amsterdam and KLM's code will appear on Qantas international flights between Singapore and Sydney, Melbourne, Brisbane and Perth. Qantas Frequent Flyers will be able to earn points and status credits on the Qantas-coded flights and eligible customers will be able to access the KLM lounge in Amsterdam. "It offers our customers another option to get to Amsterdam via our Singapore hub with more opportunities to earn status credits and Qantas Points,"
Tickets for the new codeshare services will go on sale 01 Nov, for travel from 08 Nov.
Airlines are scrambling to offer electronic boarding passes following Australian government authorisation for the process when boarding international flights. International travellers departing Australia will now be able to check into their flights on their phones. The move, alongside digital recognition at immigration, will help speed travellers through airports. The Department of Home Affairs has run several successful trials allowing travellers to use mobile boarding passes for international flights. The department urges travellers to contact their chosen airline for more information on the change and implementation. OK, so what goes into landing an Super Jumbo? Some passengers have purposely never flown on an A380, others wouldn't have it any otherway. But what about those who decide their type of aircraft for its ability to land safely, and is there any panic landing a larger bird? Qantas has opened a spacious new London Lounge at Heathrow Airport in preparation for its direct B787 Dreamliner service between Australia (Perth) and London commencing March 2018. 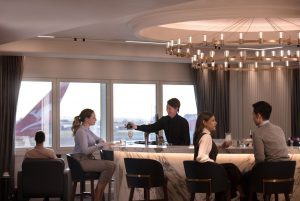 Qantas Group chief executive Alan Joyce said investing in the first dedicated Qantas Lounge at Heathrow was key as the airline prepares to directly air link Australia and Europe for the first time. Electronic Travel Authorisation Program for Canada has now come in effect, similarly to that of the USA's Esta program. Passengers travelling to Canada will need to apply online prior to travel. For the eighth year running (and since inception), DBT Corporate has maintained it's preferred Agency/TMC status with Qantas Airways receiving the award once again earlier this year. Extraordinary growth and strength in support of the Australian product were key factors to the success. Qantas Platinum Members since Day 1 ! DBT has once again been selected by Qantas Airways as a Platinum Member; premium Corporate TMC agency for 2007/08/09/10/11/12/13/14/15/16 & 17 making it a record-annual accomplishment since conception of the awards.